Calcium plays a vital role in the anatomy, physiology and biochemistry of organisms and of the cell, particularly in signal transduction pathways. The skeleton acts as a major mineral storage site for the element. Bone serves as an important storage point for calcium, as it contains 99% of the total body calcium. This combination is useful in people having low blood calcium levels; who do not get enough calcium from their diets. Calcium is the fifth most abundant element in the human body. It plays an important role in many physiological processes, including nerve and muscle functions. Not surprisingly, nutritional and metabolic deficiencies of calcium can have broad-ranging adverse effects. Since about 90% of the body's calcium is found in bone tissues, many of these adverse effects are manifested through deficiencies in the structure, function and integrity of the skeletal system. Thus this combination helps in maintance of calcium & healthy skeletal system. The most important function of vitamin D3 is its effect on bone growth, density and structural integrity. This vitamin is needed for proper integration of calcium and phosphorous to make strong, healthy bones. Vitamin D3 is important for the absorption of calcium and phosphorus. Having the right amount of vitamin D, calcium, and phosphorus is important for building and keeping strong bones. Calcium citrate is calcium salt of citric acid. Calcium (Ca2+) plays a pivotal role in the physiology and biochemistry of organisms and the cell. It plays an important role in signal transduction pathways, where it acts as a second messenger, in neurotransmitter release from neurons, contraction of all muscle cell types, and fertilization. Many enzymes require calcium ions as a cofactor, those of the blood-clotting cascade being notable examples. Extracellular calcium is also important for maintaining the potential difference across excitable cell membranes, as well as proper bone formation. It has been demonstrated that calcium from calcium citrate-malate (CCM), a mixture of calcium, citric acid and malic acid, is better-absorbed than calcium from calcium carbonate (CaCO3). Calcium is used to produce the minerals contained in bones, shells and teeth through a process called biomineralisation. Approx 33% of oral calcium absorbed via active transport and passive diffusive in small intestine. Unabsorbed calcium mainly excreted via faeces. Excess absorbed calcium excreted via urine. Well absorbed from the GI tract; Bound to a specific α-globulin. Slowly released from storage sites & skin where it is formed in the presence of sunlight. It Hydroxylated in the liver by the enzyme vitamin D 25-hydroxylase to form 25-hydroxycholecalciferol (calcifediol). Further hydroxylated in the kidneys by the enzyme vitamin D1-hydroxylase to form the active metabolites 1,25-dihydroxycholecalciferol (calcitriol). Further metabolism also occurs in the kidneys, including the formation of the 1,24,25-trihydroxy derivatives. ● Before taking this medication, tell your doctor or pharmacist if you are allergic to it; or to other vitamin D products. 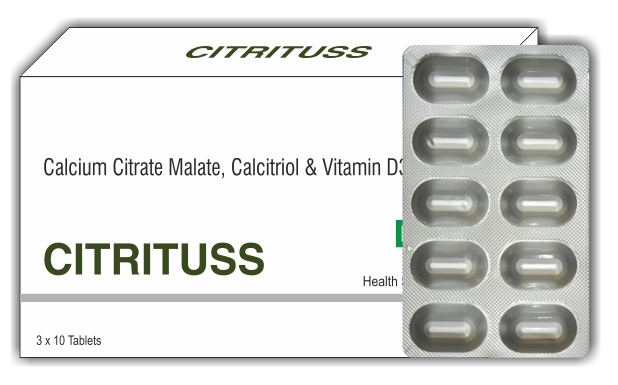 ●	This medication should not be used if you have certain medical conditions. Before using this medicine, consult your doctor or pharmacist if you have: high calcium/vitamin D levels (hypercalcemia/hypervitaminosis D), difficulty absorbing nutrition from food (malabsorption syndrome). ●	Calcium can decrease the absorption of other drugs such as tetracycline antibiotics (e.g., doxycycline, minocycline), bisphosphonates (e.g., alendronate), estramustine, levothyroxine, and quinolone antibiotics (e.g., ciprofloxacin, levofloxacin). ●	Certain medications can decrease the absorption of vitamin D (bile acid sequestrants such as cholestyramine/colestipol, mineral oil, orlistat). Therefore, separate your doses of these medications as far as possible from your doses of calcium/vitamin D.